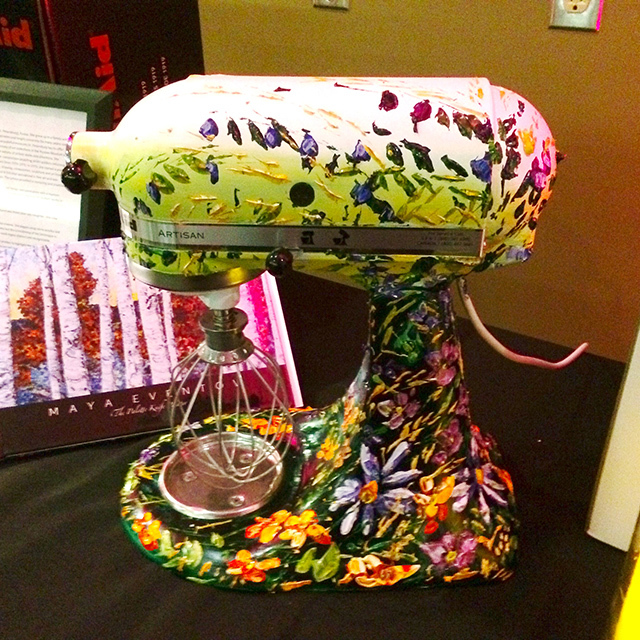 In my last post I mentioned that the reason for my trip back east was to attend the KitchenAid Cook For the Cure weekend. Today I thought I’d share the experience with all of you because it was so much fun – and all for a very worthy cause – the Canadian Breast Cancer Foundation. 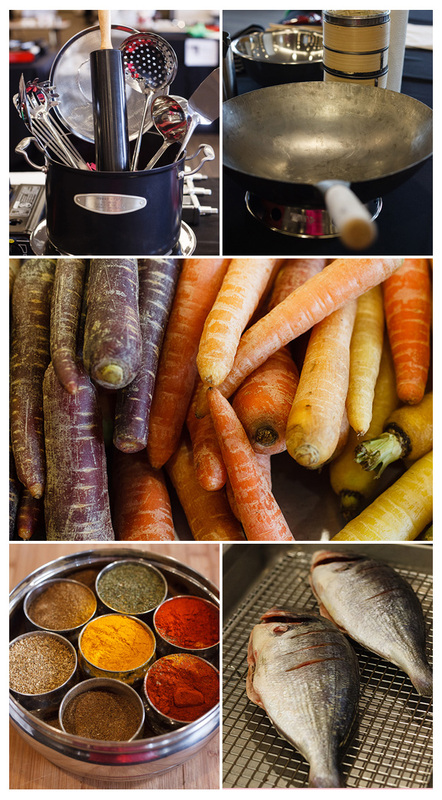 Clockwise from top left: The Culinary Showdown trophy, Chef Susur Lee’s wok, carrots and fish at Chef Mark McEwan’s station, Chef Vikram Vij’s spice tray. Last year I attended the KitchenAid Cook For the Cure Culinary Showdown as a judge for the Celebrity Chef Showdown. It was a big step out of my comfort zone but definitely one of the most interesting and fun things I’ve ever done in the food world. But as a judge, I wasn’t allowed to attend the Chef’s School. 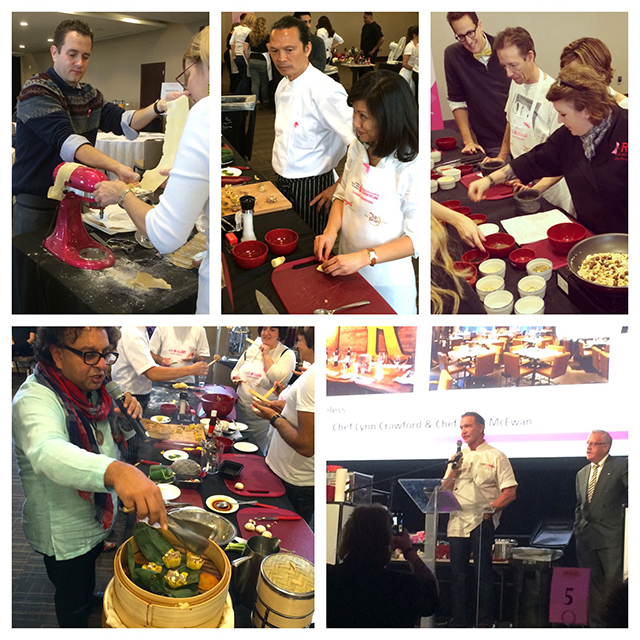 The KitchenAid Cook For the Cure Culinary Showdown is the culmination of KitchenAid’s annual Cook For the Cure fundraising campaign for the Canadian Breast Cancer Foundation. 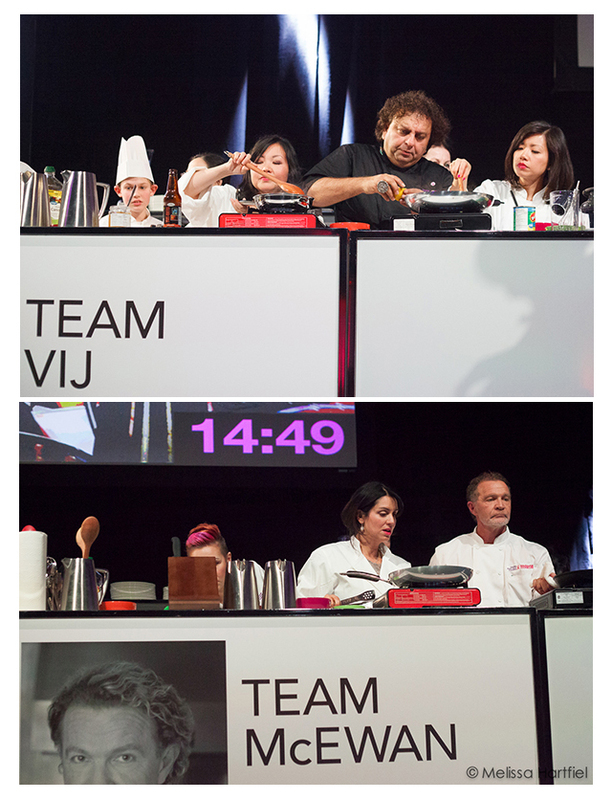 During the Culinary Showdown, 5 Food Network Canada Celebrity Chefs compete against one another in a culinary battle, assisted by teams of culinary assistants. 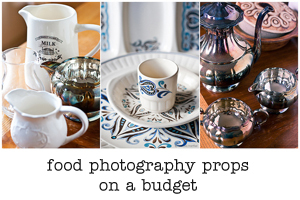 They prepare 3 dishes – an appetizer, an entree and a dessert – over the course of an evening. 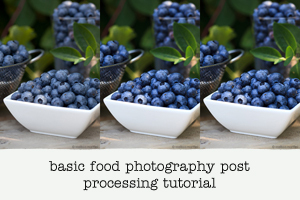 The dishes have to be prepared in 20-30 minutes and incorporate a series of mystery ingredients. But the catch is, their teams are made up of Cook For the Cure fundraisers! Those who managed to raise $2500 during the campaign win a spot up on stage assisting one of the chefs. 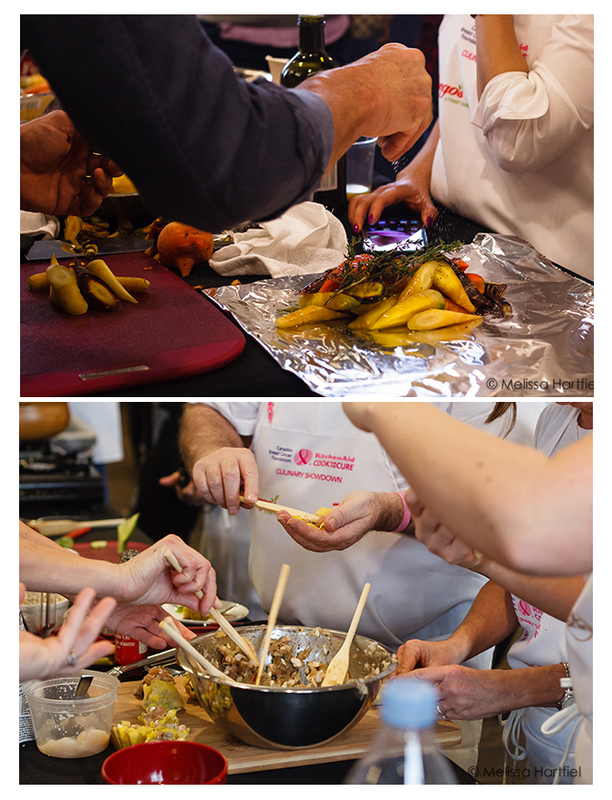 It’s a really great reward for the top fundraisers but… not all of them are trained chefs…. Chef Corbin Tomaszeski of Food Network’s Restaurant Takeover, Restaurant Makeover, and Dinner Party Wars show participants how to make pasta dough. That’s where the Cook For the Cure Chef’s School comes in! The Cuilnary Showdown happens in the evening but all during the day, the celebrity chefs and their teams spend a full day together where the participants learn cooking basics, from pasta making to knife skills, to ethnic cooking to learning the basics of seasoning their food. 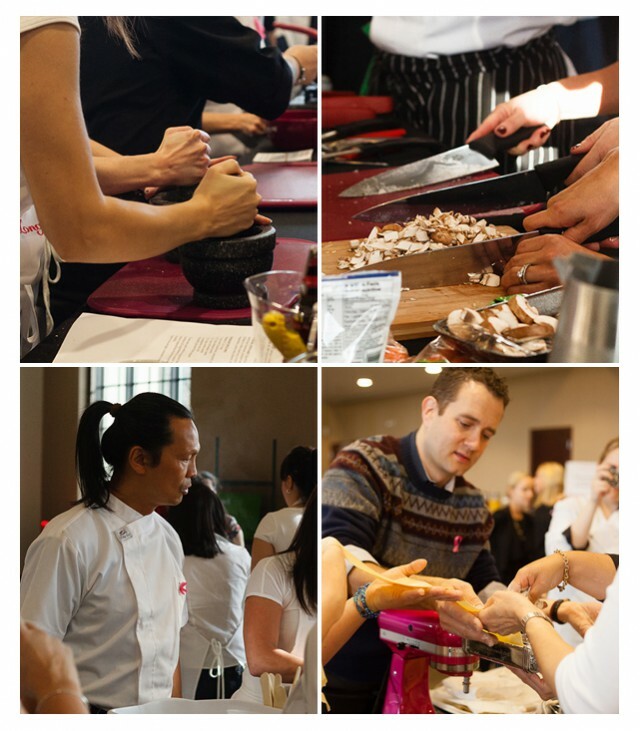 Everyone has a great time and learns a lot and it’s a chance to work with some of the top chefs in Canada! This year, my Food Bloggers of Canada partner in crime, Ethan Adeland, and I both attended and got to cover the Chef’s School and the Culinary Showdown to help raise awareness amongst our members and the general food loving public – and give a sneak peak of the behind the scenes of the event. We had a great time – it was quite the experience for both of us to be that up close and personal with the chefs and the contestants. I thought I’d share the experience in photos with all of you! 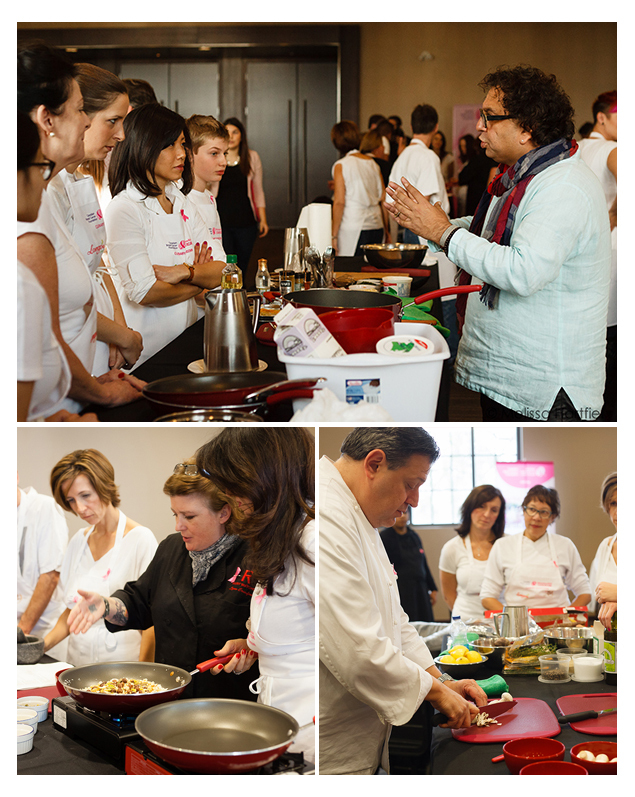 Top: Chef Vikram Vij from Dragon’s Den – and the only non-Toronto chef to participate – explains the basics of Indian cooking to his students. 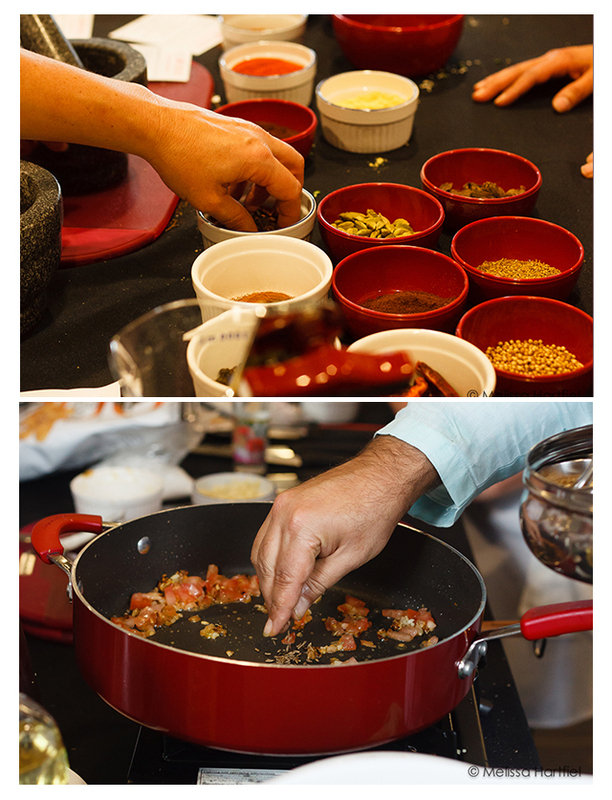 Bottom Left: Chef Lynn Crawford of Restaurant Makeover and Pitchin’ In shows participants how to season food. Once the day was over, we headed back to our hotel, got all spiffy in a cocktail dress (for me) and a suit (for Ethan) and headed back to the venue for the evening’s festivities. During cocktails we browsed the silent auction items, like this beautiful, one of a kind, hand painted by artist Maya Eventov – it was stunning! 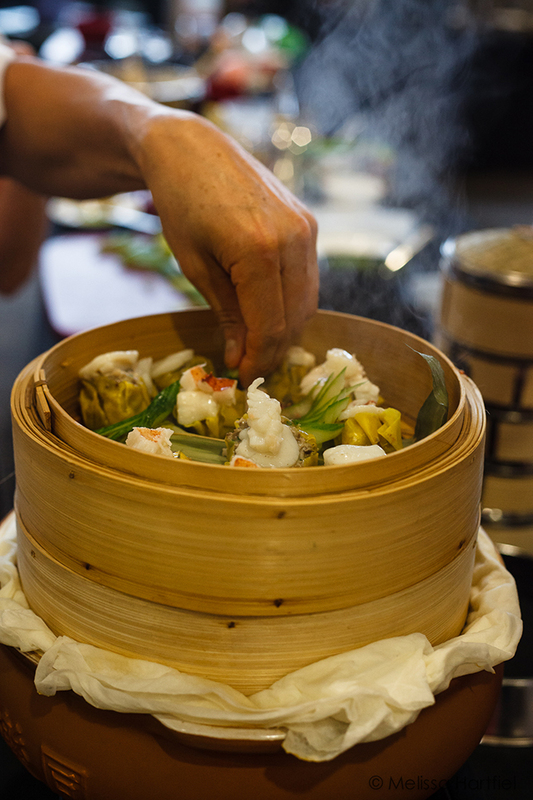 Then it was on to the main event – the Culinary Showdown. It was a fun battle with lots of good natured trash talk and a live auction but in the end, Chef Crawford and her team took home the grand prize! Disclosure: Ethan and I attended the Cook For the Cure Culinary Showdown event as guests of KitchenAid to help spread awareness of the Cook For the Cure campaign. All our travel and accommodation expenses were our responsibility. This is a wonderful event and your camera must have kept you hopping to catch all the images your show here! I was hoping to see one of you and Ethan all decked out at the evening’s festivities. Maybe next year? Wow, quite the group of chefs. You must’ve learned so much. I would love to attend an event like that, especially when it’s for a great cause! Wow! thats a great post with an amazing cause and its a great experince to attend an event like this!!! 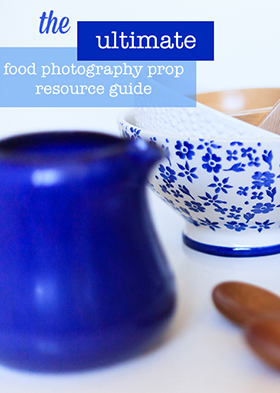 In some ways, you were in a better position for learning than the chefs’ teams – you could get tips from all the chefs. What a great event! 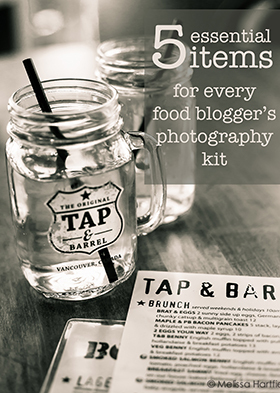 Great post.. what a great way to cook.. how i wish i had attented it too..